The LS-76 shipped with an extender board for working on the cards in its cage. However, it can go missing over the decades. It's essential to adjust a trimpot on the Variable Pitch card motherboard in order to calibrate the Clock circuit of the 555 timer which establishes the base reference for the pitch and depth system's turntable speed compensation. The daughterboards on the Variable Pitch and Variable Depth cards are attached to their respective motherboards with a long ribbon cable, which permits the tech to have it extended and be able to probe the daughterboard outside of the cage, while its motherboard is in its slot and the lathe is on. Therefore, the calibration and fine-tuning of the trimpots on those daughterboards don't require that the motherboard be extended from the slot. 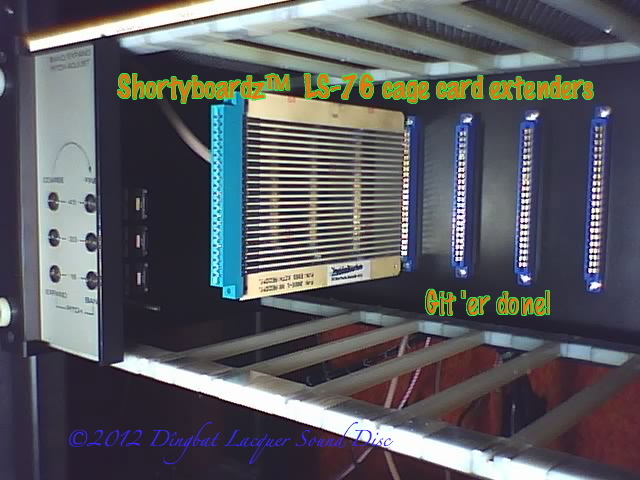 But the motherboards that have trimpots usually require an extenderboard, or ShortyBoard®, for calibration. One exception that comes to mind is the trimpot for calibrating the input to the lower ADC-898BI which is used by the Display Processor board in order to derive a voltage to drive the LPI numerical readout when the feed is expanded (whether in response to the audio-informed automation system or due to a manual override of base feed done by the operator). That trimpot can be adjusted while the Display Processor board is in its slot, normally, due to the trimpot being located at the bottom of the card and there being nothing beneath the cage. (When the feed is not expanded, the base pitch is displayed, and the switching between the readout of expansions or base pitch is done by TTL gates).